“Sow” has opened the Thai Cookery School in Aonang specifically aimed at teaching overseas visitors the secrets of Thai Cuisine. 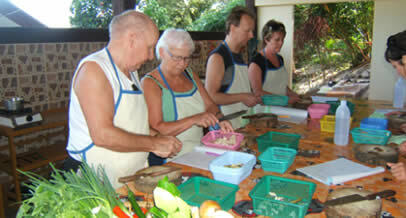 The school offers both one-day courses as well as special training opportunities on request for cooking professionals. Introduction to the preparation of various pastes and sauces extensively used in Thai cuisine. For example green curry, red curry and masaman curry. All ingredients. Fresh from Sow's garden or local market. Hands on teaching. 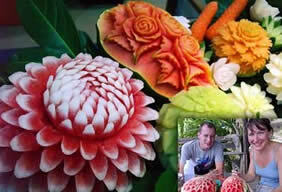 Sow can answer all your question relating to Thai cuisine and offer lots of useful hints. 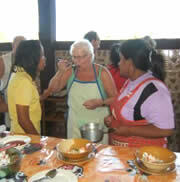 Each person gets to cook dishes of their own choice. Dishes can be adapted to a vegetarian diet or personal taste. A cook book of the recipes you will learn. You get to eat what you make, so bring a large appetite! There are now several options for this activity available and there are many agents in Ao Nang, Railay and Tonsai who can make a booking for you.